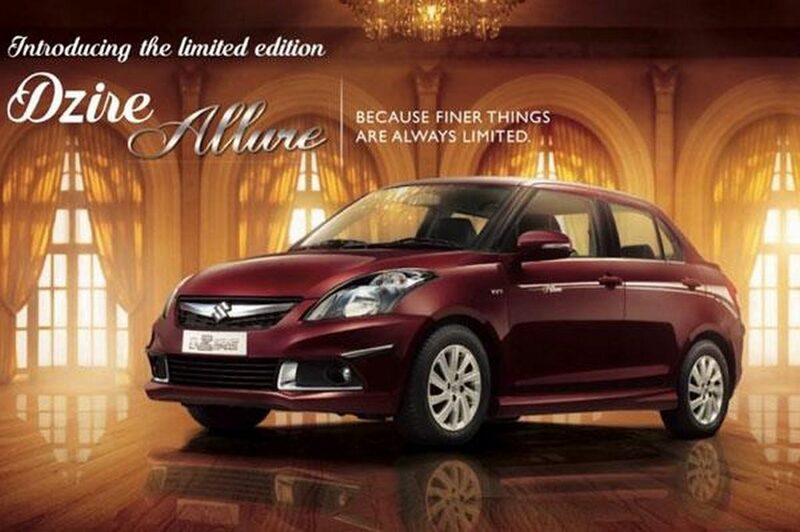 Maruti Suzuki has launched a new special edition version of the market’s bestselling subcompact sedan, the Swift Dzire. The exclusive model comes ahead of the all-new third generation Dzire’s launch, based on the recently revealed global Swift, by middle parts of this year. While the Indo-Japanese manufacturer prepares for a brand new iteration of Dzire that has already been spotted testing several times in India, it hopes to end the outgoing model’s sales on a high. Dubbed as Dzire Allure, the new limited edition will play an attractive role to rope in more customers for the already successful vehicle. An interesting part is that the Allure is not just an exclusive top-end model as it is offered in all six colour options and across the entire range of 14 variants. Fresh off the launch of Ignis, the Dzire Allure comes applied with several cosmetic touches to differentiate it from the regular sedan. It features new body graphics, new sportier side skirts, an aggressive bumper up front and rear, additional chrome garnishing around the design enhancing elements, chrome detailed Allure badge on the trunk lid, etc. On the inside, the Dzire Allure gets new front centre armrest, new floor mats, dual-tone seat upholstery, two-skinned steering cover, door sill guards and ambient footwell lighting. For an upmarket perception, the cabin gains faux wood inserts on the door panels and dashboard. Glancing over all these features on the inside and outside, it is easy to notice Maruti Suzuki concentrating on upping the visual bits of the sub-four metre Dzire sedan. However, as optional equipment, Hertz audio system with speakers, woofer and amplifier is provided as well. Due to its availability across all variants, the Dzire Allure can be bought with either 1.2-litre K-series petrol or the proven 1.3-litre DDiS diesel engine. The petrol motor produces a maximum power of 83 bhp at 6,000 rpm and 115 Nm torque at 4,000 rpm. It gets mated to standard five-speed manual or four-speed auto driving the front wheels. The DDiS mill makes 74 bhp at 4,000 rpm and 190 Nm at as low as 2,000 rpm. A five-speed manual and an optional five-speed AMT on top-end with similar mileage figures are offered. The Allure limited-run model kit can be all yours for a premium of Rs 27,000 to 38,000 over standard model with added cost for the audio system.